I've been thinking a lot lately about the the size of our house and where on earth we'll put a new baby. can we really fit 6 people in this house? the subject doesn't seem to bother me as much as it does other people. i'm torn between amusement and annoyance when i hear the wonder in there voices as they question "when are you going to get a bigger house?" and "where will you fit another kid in that house?" while other people seem to be worried about crib placement and privacy (what's that? ), i have realized that we have unintentionally become co-sleepers. 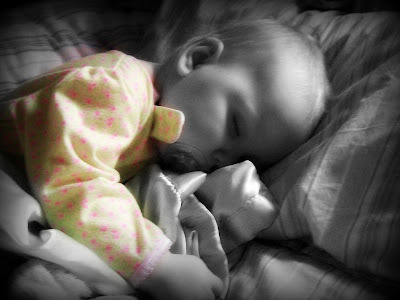 when corrina was a baby, i was adamant that she would learn to sleep on her own and she would not sleep in my bed. that worked until she was 2. then, we moved and she spent some time with my mom while i got settled. my mother spoiled her, ruined her by not making her sleep alone. 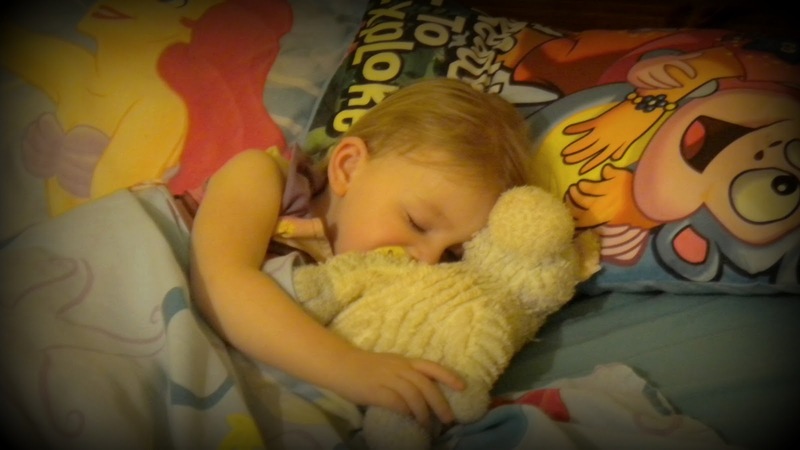 when she came home, she slept with me until she was 4. however, around 4 (probably a little sooner), she no longer wanted to sleep in our bed and quietly started sleeping in her own bed. we never had a problem getting kennedy to sleep. she would happily lay in her crib and put herself to sleep. georgia, however has never (and still doesn't) sleep through the night. she has pretty much been by my side at night always. when kennedy was about 18 months old (shortly after george was born), we tried to move her to a toddler bed, thinking that george might sleep better in the crib instead of the bassinet. neither one liked the new arrangement and both ended up in bed with me. my husband ended up on the couch for a while. then, we moved all of the girls in one room. kennedy started sleeping in the toddler bed and we added an extra full size bed for george (and me). i don't mind it. i actually enjoy laying with them to put them to bed, reading to them and talking about our day. i get up and sleep in my own bed until george wakes up, then i stay with her for the rest of the night. i like being close to the girls. i like being there when they need me. i love that george wants to cuddle me when she sleeps. now that corrina is in her own room (i have to admit that i miss her, but i'm dealing with the separation anxiety), kennedy sleeps in her old bed. she's 3 1/2 and she now sleeps alone. i no longer have to lay with her to get her to sleep. it's nothing i planned on or tried or, it just happened. she's just old enough now to do it on her own. i'm sure that george will go it alone in her own time too. i don't understand why this tends to be such a hot button topic. i want my children to always feel loved, safe and secure. i want them to know that i'm always there when they need me. i don't want them to feel like they are a burden in any way. i don't like the idea of letting them scream (especially when they're babies) just because i want to be alone. people told me when corrina was litttle and when kennedy started sleeping with me and with george too that i'm spoiling my children, keeping them from being independent and that i would never get them out of my bed. right now, i don't agree with any of those things. if i only have to roll over to wake corrina up to get her off to high school in the morning, then i'll worry. when george wants to fit a full size bed in a dorm room so i can sleep with her, then i'll have to put an end to it. i've never put much thought to co-sleeping. i've never really had an opinion for or against it. i didn't set out to make it part of my parenting style. it's just something that seems to be something we fell in to, something that works for us. as it turns out, i am a co-sleeper and i wouldn't have it any other way. I don't have kids, so maybe my opinion doesn't count for much but, when I think of co-sleeping with my future kid(s) I see a miserable sleep-deprived mommy (with a really bad hair cut, too. Or maybe that's bed head?). At any rate, the picture in my head doesn't look all that great. Maybe my view will change the first time I cuddle my very own offspring. Or maybe I'll HAVE to sleep with the baby/kid(s) out of some unforeseen logistical calamity. Yes, I'll call it a calamity. It appears my anti co-sleeping opinion is strong. I know a few people that co-sleep both by choice and by force. A married couple I know with three kids all sleep in the same room. Granted, the kids are all six and under BUT how can you get a decent night's sleep that way? The father works, so I think if it gets too bad he would move to the couch, but the mom stays at home with the kids and they probably nap together anyway (Do stay-at-home moms get a nap?) They seem to like the arrangement, but I'm not sure what benefits are associated with co-sleeping? Anyone care to fill me in??? i think that picture of motherhood applies to all mothers at some point, regardless of their sleeping arrangement! actually, the main reason we (and by we, i really mean me)started sleeping with the kids is because we so desprately needed sleep. we actually get more sleep than when we were fighting to keep everyone in their own bed. it's much easier to take care of a baby's needs and anticipate what they might need when you're with them. it also gives the baby the security she needs to be able to sleep well. it also brings mom and baby that much closer. that's why we do it. you'll have to excuse my ignorance. i don't know how to post a link in the comments. P.S. i don't know about most stay-at-home moms, but i definitely don't get a nap. it's possible if you still have a baby, but i haven't been able to nap since kennedy was a baby! I know this was posted almost 2 years ago but I'm going to throw my opinion in here because it's been going through my mind a lot. I am not a stay at home mom (most of the time) and at the moment I don't co-sleep. However, when Aela was first born she was up every two hours to eat. I was so tired we would fall asleep in the chair together and not wake up for hours. We both got used to this. Then she went through a phase where we had to rock her until she was sound asleep. This went on for about three months. So between those times if I couldn't get her to sleep or if I was just too tired, I would sleep with her. I know the dangers of sleeping with a baby but I saw no other way. I would either sleep sitting up with her in my arms or, when she was a bit older, I'd sleep on the couch with her on my chest or in the crook of my arm. I loved those times. I miss those times. To even get her to nap I had to sit and rock her and it was exhausting. So one day when she was tired I decided to lay her in her bed and see what happened. And she instantly fell asleep. So that's what we've started doing. Now she's 6 months old and she wakes up around 530 or 6 and she's ready to go. If it's my day off I certainly don't feel like getting up. So I lay with her on the couch and she usually goes back to sleep. When I'm at home and I'm really tired, we take a nap together on the couch. And those are my favorite times of the day.